Opposition lawmakers and protest leaders claimed the government had planted provocateurs among the protesters to undermine the legitimacy of yesterday's event. 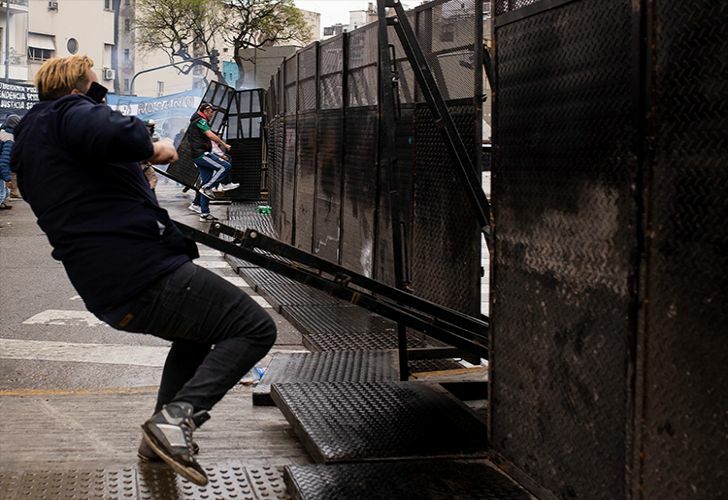 Argentine authorities released 26 people who were detained on Wednesday during clashes between protesters and police outside the country's Congress. As the Lower House moved to pass the 2019 Budget, a small group of protesters set rubbish bins alight, knocked down security fences and threw stones and rocks. Police in riot gear responded with tear gas and rubber bullets. Among the detainees was the editor of the leftist magazine La Garganta Poderosa, Ignacio Levy, as well as shipyard workers whose unions are currently engaged in strike activity with the government over lay-offs in that sector. "We have identified police officers by name. Tomorrow we will lodge a criminal complaint against [national Security Minister] Patricia Bullrich and another against authorities from Buenos Aires City's Security [Ministry]," lawmaker Horacio Pietragalla, of the Kirchnerite Victory Front bloc, told Congress. "They put provocateurs in the street. There are six people with their faces covered, all dressed in black to pretend they're anarchists," lawmaker Leopoldo Moreau added.